Well, we’ve almost made it through the first month of the new year. The holidays are over and done with. Champagne and Auld Lang Syne are a distant memory once steeped with positivity and eager foresight. And now, for most, the resolutions are beginning to teeter. The work-outs are getting shorter. The carbs are in full re-entry mode. Self-doubt is rearing its ugly head. At the end of every year, we pressure ourselves to resolve to change things about ourselves in the new year. The misstep in that, for me, is that we’re saying that something is broken and needs to be fixed. I mean, sure, we all have things we’d like to adjust in our bodies and lives, but the stress of “the resolution” can’t be good for the cause. Aren’t we just setting ourselves up for the fall? I personally made an adjustment this time around. After a year of conscious hard work within myself, I wasn’t about to trip it all up with some invisible, yet forced, vow to lose 10 pounds or regularly organize my piles of paperwork or always put my laundry away as soon as I’ve folded it. All worthy goals to work on if the modification will make me happier. But, rather than pledging to do something that will inevitably make me feel guilty if I’m unsuccessful at it within the set timeline, I’m working on intentions. Ideas, notions, hopes, guidelines. No hard and fast rules or official goal weights, just intentions. Broad strokes in life. The end-game for me has to be happiness and contentment. Granted, this hasn't always been the easiest category for me to fulfill for myself. It’s one of my intentions that is a constant work in progress. Figuring out how to just be ok with it all can be tricky. What I’ve learned for myself, is that sometimes just sitting with “it” for a while helps me be ok with “it” (whatever “it” is). Once I've come to terms with why I’m uncomfortable or unhappy, I’ve noticed that it seems to naturally works itself out. 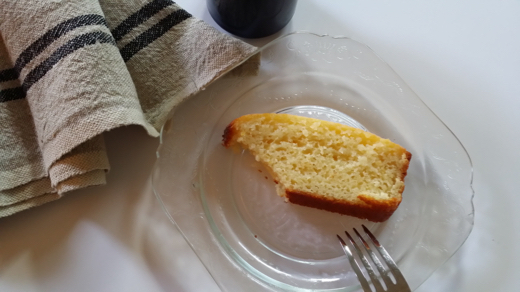 Take this lemon yogurt cake, for instance. A lot of you have a wicked sweet tooth, and may have resolved to cut out treats all together in the new year. Don’t be crazy. If it’s something you enjoy, just figure out a way to easily manage it for yourself. This recipe calls for yogurt and a little bit of vegetable oil, instead of the loads of butter in most cakes. And, truly, there is no trade out in flavor. In fact, I prefer the added tartness and light texture to this recipe over others, so far. Obviously, don’t go nuts and eat the whole loaf. But, have an occasional slice, and let yourself enjoy it. “It” is ok.
Perhaps, moderation is the best resolution of all. Preheat the oven to 350 degrees. Grease an 8 1/2 to 9-inch loaf pan. Sift together the flour, baking powder, and salt into one bowl. 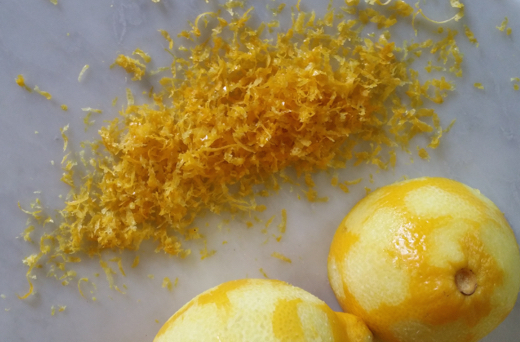 In another bowl, whisk together the yogurt, 1 cup sugar, the eggs, lemon zest, and vanilla. Slowly whisk the dry ingredients into the wet ingredients. With a rubber spatula, fold the vegetable oil into the batter, making sure it’s all incorporated. Pour the batter into the loaf pan and bake for about 50 minutes, or until a cake tester placed in the center of the cake comes out clean. When the cake is done, allow it to cool in the pan for 10 minutes. Then, carefully remove it from the pan and place it on a baking rack over a sheet pan. While the cake is still warm, pour the lemon-sugar syrup mixture over the cake and allow it to soak in. Cool completely. For the glaze, combine the confectioners’ sugar and lemon juice and pour over the cake.